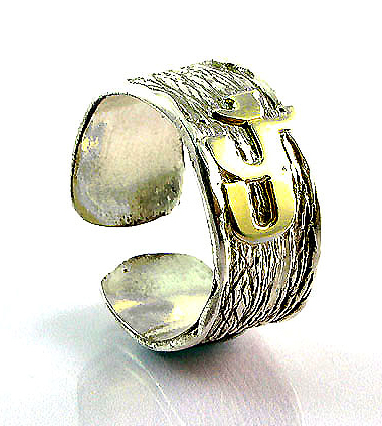 Keep the Kabbalistic power of the 72 names close at hand with this adjustable sterling silver ring from Emunah Jewelry.+The Jerusalem-based Judaica designers have created a wide silver band of engraved oxidized silver, which makes a dark, textured background for the Kabbalah acronym, or name, KLY that is overlaid in gold. All of Emunah's jewelry uses the best materials available – 925 sterling silver, 9/14/18 karat gold, pewter, and precious and semiprecious stones. Each piece is stamped with the company's ID to ensure quality and prevent imitations. All Emunah jewelry comes with a warrantee.+Wear this ring yourself, or give it as a gift to a loved one. Kabbalah jewelry and amulets are known for their abilities to bring protection, success, good luck, security, wealth, and health to their wearers. Each piece has its own unique mystical powers and special meaning, allowing you to select the one that best meets the needs of the wearer.